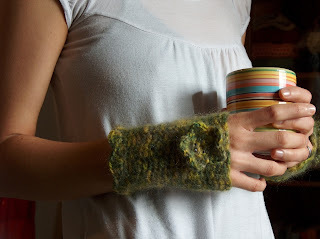 I'm so in love with handwarmers in this period! I'm making lots of them in any color, knitted or crocheted. These in the pictures are all crocheted with a green mohair yarn that remains from the Eyelet Vest i've made last month. They are so quick to make, on the contrary of the knitted ones; but maybe it depends on my predisposition to crochet! I sell these on my Etsy shop, but maybe soon i'll write a pattern for them..they are easy and beautiful!